Sonification demo — Bending Energy algorithm output mapped to synthetic speech synthesizer. What this system could sound like as a imagine user walks down a busy city street while listening to music. The detection system is housed by a cell phone application which is mounted onto a pair of the virtual-reality goggles. As objects approach the listening user, the app applies real-time signal processing to the music that describes the shape of the object. R2-D2 as a data sonification design prototype? Burtt arrived at an integration of synthesized and human speech sounds, in part through an initial process of ‘vocal sketching’ — a useful technique for rapidly prototyping sound design concepts, such as for new devices, auditory displays or systems. Inspired by Domino pizza delivery people in the Netherlands. 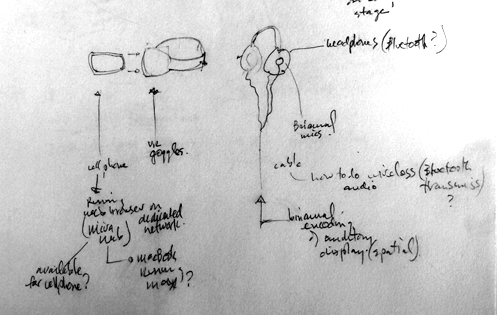 Designing listening (‘choreographies of attention’) rather than designing sound. • Pair of headphones wired up with a binaural microphone at each ear. • A cell phone app mixes the different signals automatically according to the detected presence and shape factor of objects that enter the user’s detection system. 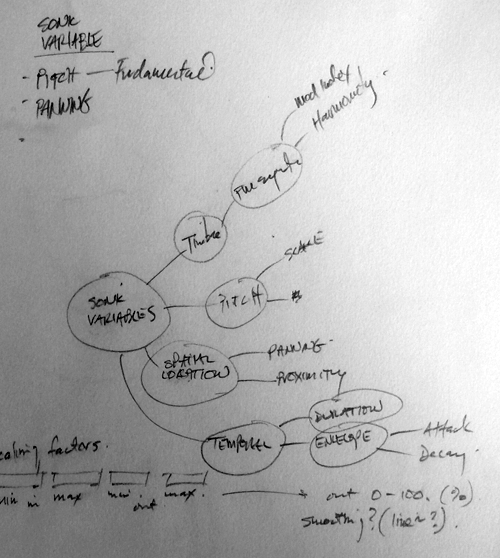 Mind mapping sonification variables for experimentation. For next meeting — we will assemble a various of small moving objects to document on video for purposes of experimentation with sonification through computer vision. ▪ Identify #1 but while object is moving.